Engen fans all over the country were intrigued and confused this week by several key changes to the engenbooks.com website, and not just in its new look. In the late night of August 22nd, 2009; two mysterious links appeared in the top menu bar of the site that raised instant speculation amongst fans: one labeled “Infinity” and one labeled “Curtis?”. We caught up with Engen founder Matthew LeDrew in an attempt to learn more about the subject. Engen Books: So, what is “Curtis?”, and why does it have a question mark at the end of it? Matthew LeDrew: That’s the tentative name on a project that we’re going to be announcing more on very, very soon and will be launching (along with Roulette) at Newfoundland’s West Coast Con this October. ML: A little, but no more so than the first Womb book. Just because publishing announcements sometimes happen quickly, does not mean it hasn’t been in planning stages for some time. The person involved in this project is one of the most prolific writers I know, and the fact that they don’t have a work of their own out yet is actually staggering. Some might think this is fast, but to us its been a long time coming. EB: So, “Curtis?” is not the name of the book. ML: Lord no. What? What kind of a question is that? (laughs). That doesn’t even make sense. EB: Is it safe to assume then, that this will involve Engen author Ellen Curtis? ML: Nothing can be said so far. It’s all up in the air. ML: But… there’s a question mark. EB: Okay, what can you tell us about “Infinity”? ML: Next to nothing, at the moment. It’s always assumed that I know all the little knooks and crannies of this company… some things escape my notice. Even if I did know something about it, I wouldn’t really be able to comment on it yet. I can tell you that “Infinity” has been in the plans almost as long as Black Womb has, and we’re very excited to have it finally becoming a reality. EB: When can we expect to know a little more? ML: Soon. Formal announcements will wait until the end of year, I think, but trickles should be happening soon. It should have it’s own sub-site soon enough. EB: I see… I can’t help but notice that NewFoundSpecFic is missing from the lineup. Any comment on that? ML: The NewFoundSpecFic team are a group of amazing authors that honestly outgrew Engen. Devin Drover and Jennifer Graham are both richly talented, wonderfully entrepreneurial people and it was a waste of their considerable talents to have them toiling away as mere authors under Engen. They deserve better, and now they’re going to be getting it. Expect big things from these two very soon. EB: Any regrets on that? ML: Millions. But, as the old saying goes… if you love something, let it go. I love NewFoundSpecFic and it’s authors… but its just time to let go. EB: Anything else you want to add to that? ML: Not really. I’m going to miss them. I’d really prefer not to speak on it right now. EB: So, will Ellen Curtis be staying at Engen? ML: Ellen is a uniquely talented young lady and I would not give her up for all the tea in China. Yes, Ellen remains an Engen author. Though she is not exclusive to us. I do not hold the monopoly on Ellen Curtis… although some days I wish I did. That monopoly will be worth millions one day. ML: Roulette and Ghosts of the Past are both on schedule. Trains keeps moving, as they say. Engen remains strong and will remain strong. EB: So my job is safe? ML: Your job is safe. Engen Books News would like to thank Matthew LeDrew for sitting down with us today. Its been a busy summer over here at Engen Books, but now that things are finally starting to wind down we can catch up on the events that matter! Polaris 23 went ahead as scheduled from July 10-12 in Toronto, Ontario. The Richmond Hill Sheraton was packed with Black Womb and NewFoundSpecFic fans, as well as many newcomers picking up the series for the first time! Black Womb and Smoke and Mirrors author Matthew LeDrew was in attendance, teaching panels on art and publishing, as well as recording podcasts for comic fan-zines! “Matthew was also a very funny guy and I enjoyed being on the panel with him,” Clare Moseley (writer/artist on The Otherkind and Matthew’s co-panelist on The Basics of Art for Noobs) commented on her blog. Also in attendance were Stargate stars Claudia Black and David Hewlett, as well as Star Trek: The Next Generation‘s Michelle Forbes, Iceberg Publishing author Kenneth Tam, and many more! As for the rest of the summer, plans were finalized to launch the fourth book of the Black Womb series, Roulette at NWCC (Newfoundland’s West Coast Convention) October 24-25, 2009 in Corner Brook. Newfoundland’s premier science-fiction convention celebrated its third consecutive year this past weekend, with rave successes. Nearly a thousand people from the province and beyond came out to attend writing seminars, talk with authors, and meet with the stars of the Star Wars and Star Trek franchises. The convention was kicked-off on Friday, April 24th with the launch of Kenneth Tam’s newest alternate-history novel, The Frontier. The launch, which was attended by a packed house of fans and convention goers, was emcee’d by Engen’s own Matthew LeDrew. “It was an honor to be asked to do the launch,” LeDrew remarked on the experience. “I think it speaks to the general atmosphere of cooperation and comradery that surrounds science-fiction in general and this convention in specific. There’s no real competition between business present, just the general attitude that if one of us wins, we all win. Beyond the launch, festivities continued throughout the weekend and including book signings, seminars on writing, publishing and screenplay writing. Other guests of the convention included Star Wars‘ Peter Mayhew and Christian J. Simpson; as well as veteran Star Trek actor Vaughn Armstrong. Matthew spoke at eight workshops over the two day convention, some alone and some alongside fellow author Kenneth Tam, on a variety of subjects from the tools needed to become a writer to the do’s and don’ts of screenplay writing. The Sci-Fi on the Rock writing seminars have provided fruitful material for Engen Books the last two years, a trend that LeDrew says he hopes to continue this year. “I met Kenneth Tam when he spoke at a writing seminar at the very first Sci-Fi on the Rock, back in 2007.” explained LeDrew. “With his help I was published myself by the next year. We teamed up for seminars at the second Sci-Fi and in one panel I met both Devin Drover and Ellen Curtis, who I signed on during the interim and who were both published under our creator-owned imprint, NewFoundSpecFic. 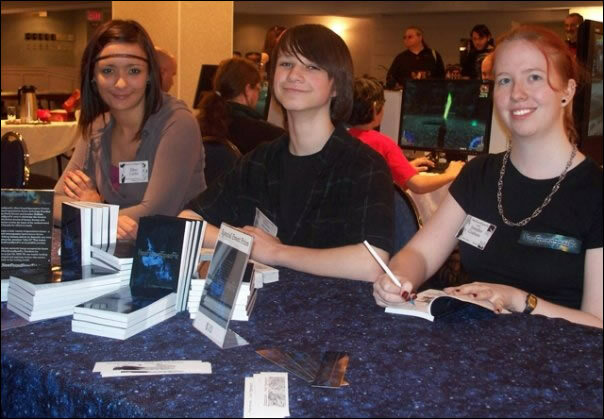 NewFoundSpecFic was also in attendance during the convention, with its all-star authors Ellen Curtis, Devin Drover and Jennifer Graham. Fan reaction to the trio was phenomenal, with potential authors young and old wondering how they could join the NFSF team. Sci-Fi on the Rock III countdown begins! There are only ten days left before the start of Newfoundland’s biggest science fiction convention! It’s the time of year again to get out your phasers and teleports for the third annual Sci-Fi on the Rock! This year’s lineup includes Peter Mayhew (Chewbacca from Star Wars), Vaughn Armstrong (Star Trek), Christian J. Simpson (Star Wars: Episode 1) and author Kenneth Tam (Defense Command, His Majesty’s New World). At the Engen table, Matthew LeDrew returns again this year to teach seminars on writing and publishing, as well as sign autographs and take part in the scheduled ‘author readings’ this year. He’s bringing back his two former successes Black Womb and Transformations in Pain, as well as introducing his newest novel, Smoke and Mirrors, to the general public. Two authors that attended the writing / publishing seminars last year have already been published this year, so all young writers are encouraged to come! NewFoundSpecFic will also be present at the con, with the various authors working in shifts to sign and greet fans. Try to collect them all! Sci-Fi on the Rock III is being held at the Holiday Inn in St. John’s, Newfoundland. For more information, click here. Matthew LeDrew (Author)The most daring paranormal thriller series of the last decade becomes a legal thriller in Smoke and Mirrors! Serial killer Adam Genblade is on trial for the murders that ravaged Coral Beach last September, but public perception of his guilt begins to waver when murders fitting the exact same M.O. are committed while he is still behind bars. Is this the work of a copycat killer… or is the reality of Genblade’s guilt all just a magician’s trick of smoke and mirrors? Download the continuation of the Bestselling Superhero series that Jay Paulin raves “is a mature and complex tale with many twists and turns that is sure to please fans of action, drama, horror and mystery” today! NewFoundSpecFic received its official launch last Saturday at the University Center of Memorial University to raves from the student body and beyond. Authors Jennifer Graham, Ryan Marsh, Ellen Curtis, Breanne Milley, Joshua Quinlan and Devin Drover were all in attendance to meet fans, sign autographs and generally immerse themselves in the experience of the launch. NewFoundSpecFic has already garnered much media attention and anticipation of its release has been high for weeks. When asked to remark if the successful launch meant a NewFoundSpecFic vol. II, co-author Jennifer Graham remarked that there would. The stories by Graham originally published in Newfoundspecfic have been reprinted in Sci-Fi from the Rock. Over the past few weeks we’ve gotten a number of letters with regard to the highly anticipated third book in the Black Womb series, Smoke and Mirrors . Rumor has circulated ranging in topic from the books premise and plot (and of course, who will survive); to more technical questions such as what this title means for the series as a whole and perceived delays in publication. Online speculation has lead many fans to wonder the fate of the series and its characters after this novel… with more than one post questioning the fate of Black Womb itself. “The series itself is going strong. We’re nowhere near ready to call it a day yet. As to the fate of the characters, well, you’ll really have to read it to find out. I can tell you that anything can still happen, and that I really don’t think anyone has seen this particular ending coming yet.